Enhance any bedroom with the addition of our Empire Amish Bed. 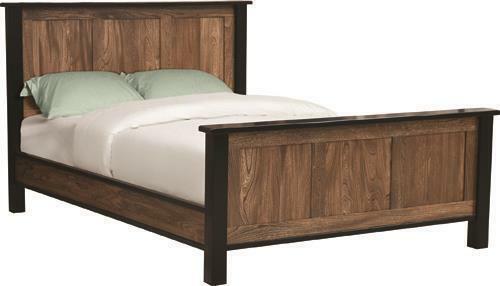 Handcrafted by our Amish artisans, this solid wood panel bed will surely make a statement in your suite. The beautiful contrast of elm wood with a dark walnut stain and painted black posts and tops will help add style in your bedroom oasis. Available in a twin, full, queen or king size, this Amish handmade panel bed will accommodate your standard mattress and foundation. Select you wood, size, and finish options by selecting "Select Options" at the top right of the page. Call one of our Amish Furniture Specialists today at our toll free number - 866-272-6773 with any questions that you may have. Shown in Elm with Dark Walnut Stain and Painted Black Posts and Tops.